Recent findings suggest a novel approach for protecting people with diabetes from their higher risk of advanced blood vessel disease, which sets the stage for early heart attacks and strokes. 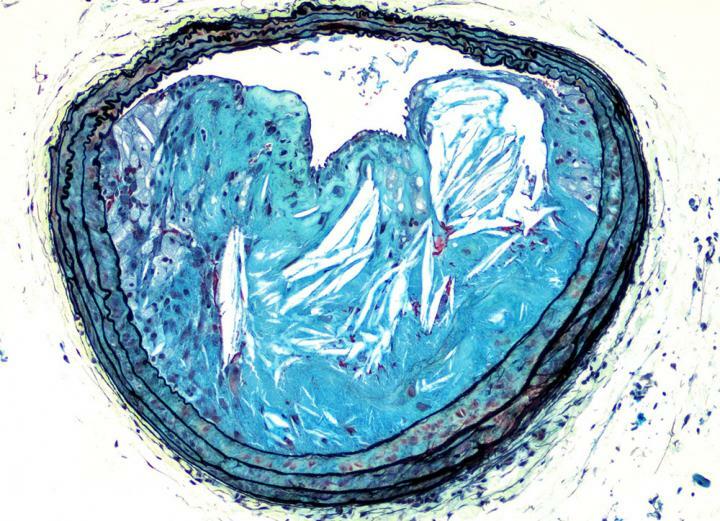 Cardiovascular problems from atherosclerosis – plaque-like lesions forming in artery walls – are the major cause of death in people with type 2 diabetes and metabolic syndrome. People with metabolic syndrome exceed the normal range for several clinical measurements: blood pressure, blood sugar levels, harmful lipids, body mass index, and belly fat. The researchers studied mice with metabolic syndrome. The mice were obese and had impaired glucose tolerance, a sign of pre-diabetes. In the study, an insulin-mimicking synthetic peptide called S597 was shown to both reduce blood sugar levels and slow the progression of atherosclerotic lesions. Insulin, even when it controls diabetes, does not prevent atherosclerosis. The findings are published in the Feb. 26 issue of Diabetes, a peer-reviewed scientific journal of the American Diabetes Association. The senior author is Karin E. Bornfeldt, University of Washington School of Medicine professor of medicine, Division of Metabolism, Endocrinology and Nutrition. Jenny Kanter, UW research assistant professor of medicine, was the lead author. They are scientists at the UW Medicine Diabetes Institute. The study was conducted as a research collaboration with Novo Nordisk A/S. Although S597 is composed of a single chain of amino acids and looks nothing like insulin, S597 can still activate insulin receptors. But, unlike insulin, it's more selective in what it turns on inside the cells. This study showed that, when S597 binds to insulin receptors, it preferentially activated a signaling arm known as the Akt arm, which is associated with lowering blood sugar levels and with other beneficial effects. It only weakly activated, or may have even prevented the activation of, another signaling arm, called the Erk arm, that is suspected of causing undesirable side effects. The researchers were impressed by the mechanisms behind the S597 slow-down of atherosclerotic lesions. Atherosclerosis starts with fatty streaks appearing in blood vessel walls. As the atherosclerotic lesion grows, inflammation provoked by obesity and recruitment of immune cells can speed the growth of the plaque. Certain white blood cells, particularly monocytes that participate in inflammation, and macrophages, or "big eaters" that are supposedly the bloodstream's cleanup crew, are among the culprits. They can become overladen by engulfing lipids, and can turn into foam cells. These cells gather, and then perish. The core of the lesion fills with dead cells and other debris. If it ruptures, a clot can rapidly form in the vessels of the heart or brain. In mice given S597, the problem with excessive white cells in the lesion seems to be nipped at its source: the early stages of production of inflammatory monocytes and macrophages. The S597 treated mice did not seem prone to the high white cell count characteristic of the inflammation induced by metabolic syndrome and obesity. In fact, the amount of blood-forming stem cells in the bone marrow was lowered to levels observed in lean, healthy mice. These stem cells exhibited less activity from the undesirable signaling pathway originating in the insulin receptors. The numbers of macrophages dying in the lesion were also fewer. While the number of intact cleanup cells rose, the relative content of macrophages in the lesion cores did not go up. The S597 may have either kept more macrophages alive longer or impeded their pile up. Probably because of all this influence on white cells, the lesions did not grow with the rapidity expected in diabetes and metabolic syndrome. The researchers also saw that lesions with debris-filled cores were less common in these mice. The researchers noted that the S597 did not alter cholesterol levels in the plasma or systemic inflammation overall. "Cholesterol lowering drugs like statins are making a big impact in our ability to prevent cardiovascular disease associated with metabolic syndrome and diabetes," Bornfeldt said. "We think that the results of this new study provide a conceptually novel treatment strategy to explore as an additional possibility for protecting against advanced atherosclerosis associated with metabolic syndrome and type 2 diabetes." There is only one previous study of the effects of S597 in living organisms. This new study is believed to be the first reported to evaluate the effects of S597 on the blood vessel system. Funding for this work came in part from National Institutes of Health grants and from a STAR postdoctoral fellowship from Novo Nordisk. Three researchers on the study are employed by Novo Nordisk A/S, which also supplied the S597 peptide for testing.